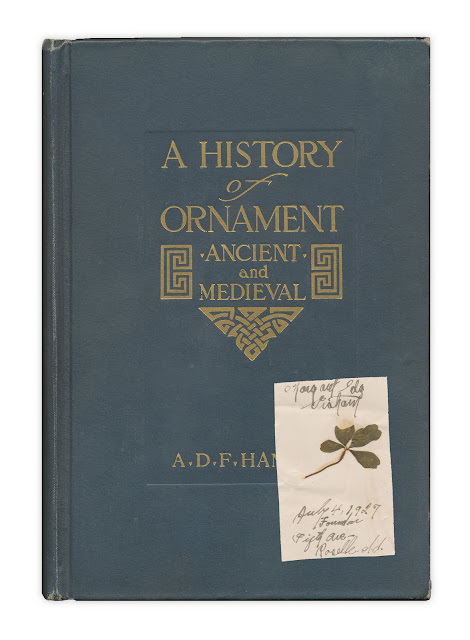 Found in "A History of Ornament, Ancient and Medieval: Volume 1" by A.D.F. Hamlin. Published by The Century Co., 1916. This is so sweet. Lovely. What's in the lucky book? A four leaf clover! How very interesting. According to Google maps, there is a Fifth Ave. in Roselle NJ, but not in Roselle IN. Not sure if the writing can be stretched to NJ, but it's a thought.